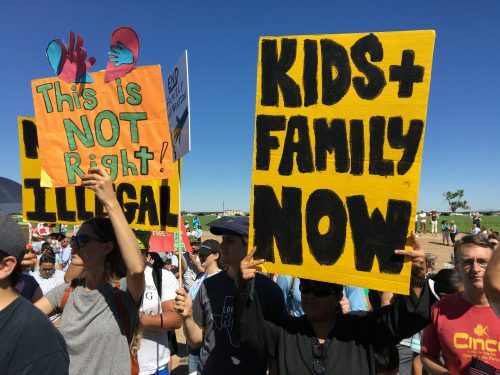 With signs in English and Spanish reading “Families Belong Together” and “Niños: Los amamos y no los olvidamos,” protesters from across the Southwest and throughout the country marched up and down the shoulder of the toll road leading to the Tornillo-Guadalupe Port of Entry. Less than a half-mile away, the tops of several white tents were visible over a chainlink fence on Customs and Border Patrol property. As of Sunday morning, 200 unaccompanied migrant boys ages 16 and 17 were living there. The World Cup was blaring from loudspeakers near the tents on the morning of the march. 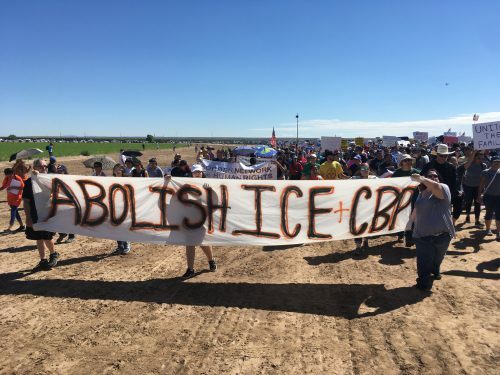 Texas Congressman Beto O’Rourke and former El Paso County Judge Veronica Escobar announced the protest event late Friday evening. 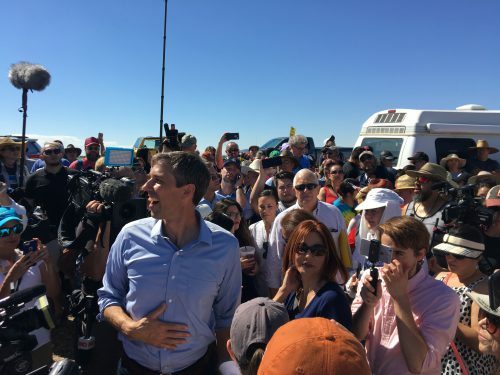 O’Rourke said Sunday morning that capacity at the Tornillo shelter could increase to 4,000 beds. “But whether you’re in tents, whether you’re in a four-star hotel, if you’re not with your mom and your dad, if you’ve been taken from them, you’re traumatized,” said O’Rourke. O’Rourke hasn’t been inside the facility. But he says the Department of Health and Human Services told him about 20 percent of the migrant children at the tent city have been separated from their parents. 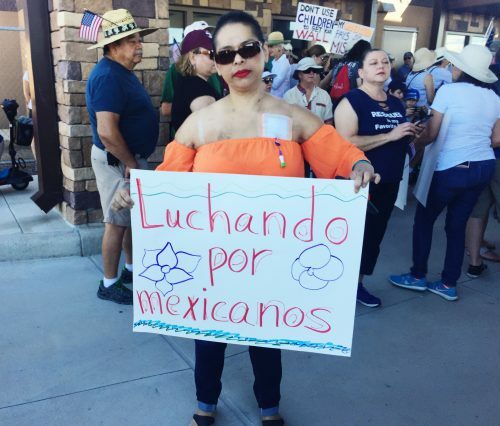 Family separation and the use of temporary shelters to house children are the main reasons protesters like Monica Ramirez attended the march. Ramirez, who grew up in El Paso, says it was important for her to be here. 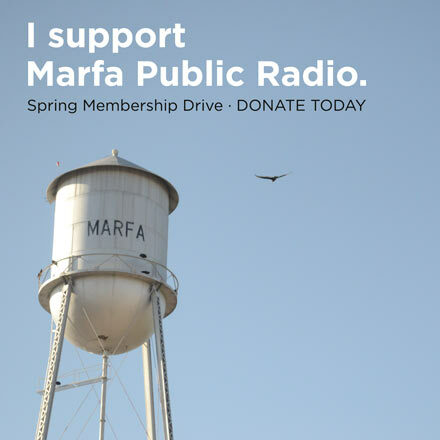 Reporters haven’t been able to see the detention center, but Texas officials like Republican U.S. Representative Will Hurd and State Rep. Mary González, whose districts include Tornillo, have. Hurd said the site is well maintained. There are bathrooms, showers and medical facilities. He also says there are case workers trying to place the children with family members. “This isn’t a republican or democratic issue, this is an issue about how you should treat children,” said Hurd on CNN. 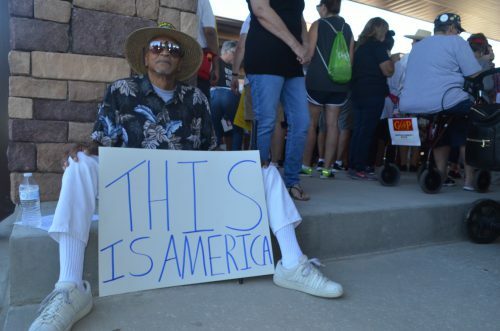 Other officials attending the march included Democratic nominee for Governor Lupe Valdez; Texas state Representatives Mary González, Lina Ortega, Joe Moody and César Blanco; Gina Ortiz-Jones, Democratic challenger to U.S. Representative Will Hurd; and former state Senator Eliot Shapleigh. 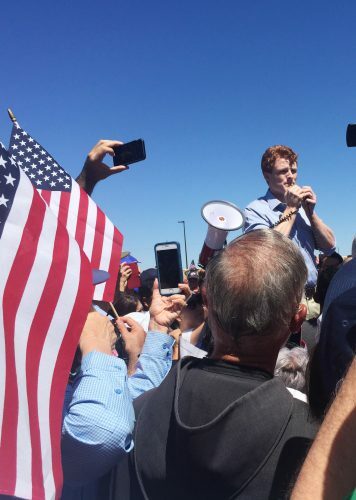 Joe Kennedy III, a U.S. Representative from Massachusetts, also made an appearance. 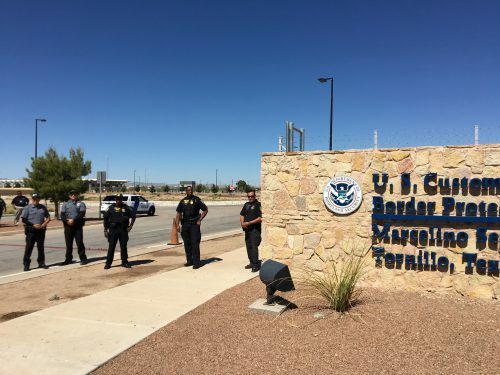 The Tornillo port of entry was home to a tent city in 2016. Then, officials set up the temporary shelter site for the scores of unaccompanied children from Central America that were crossing the border. That same year, the international bridge was named after Marcelino Serna, a Mexican immigrant who became Texas’ most decorated soldier in World War I. This entry was posted in KRTS News and tagged Border, March to Tornillo, Tornillo. Bookmark the permalink.